The thought of tackling concrete repair or home improvement projects can be intimidating. How much will it cost? How disruptive will the project be? Where do I even start? With the proper tools and planning, concrete projects are a cost effective way to make improvements to the home. Check out the new how-to videos on QUIKRETE.com for step-by-step instructions and complete shopping lists. Concrete is so durable and dependable it's easy to take it for granted. But like any other surface around a house, concrete needs maintenance -- and sometimes repair. In fact, performing simple upkeep on concrete surfaces when problems are relatively small can spare homeowners the time drain, expense and aggravation of minor problems that have developed into major issues. Resurfacing old, worn or spalled concrete is an economical alternative to removal and replacement. Replacement can cost $3.50 or more per square foot whereas resurfacing - using a material such as QUIKRETE Concrete Resurfacer -- costs 25 to 30 cents per square foot. 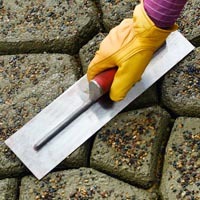 For more project ideas and information on concrete maintenance and repair, check out www.quikrete.com. Click here for a complete library of project how-to videos. SEE ALSO: Set fenceposts or mailbox posts without mixing. SEE ALSO: More projects around the house. Q&A: Can I Use QUIKRETE WalkMaker Under My Car? I want to use QUIKRETE WalkMaker to make an area by my garage where my car can drive. I plan to prepare the base with several inches of gravel (compacted with a gas-powered tamper) and possibly a layer of compacted sand or pea gravel before applying the molds. Would this support the weight of a vehicle? The concrete sections produced with QUIKRETE WalkMaker will be as strong as any other concrete and will support weight, just as concrete, concrete blocks and pavers. However, because QUIKRETE WalkMaker sections are separate, they will float on the gravel and move under the weight and movement of the car. Placing the sections one-half inch apart -- rather than wider -- will help. It will also help to firmly lock into place the outer edges. One way is to recess the entire area so that the top is level with the surrounding ground. Many people use pavers or concrete block for driveways and enjoy long lifespans, though nowhere near the longevity as a standard concrete slab. Eventually the sections will move and become uneven. Freeze thaw cycles accelerate the movement, as does uneven rain water flow. However, a gravel substrate preparation plan will help alleviate those concerns. We want to hear from you. If you have a question, please send it to the QUIKRETE Technical Center. We're ready to provide you with the technical assistance you need. QUIKRETE has launched 18 new how-to videos designed to make users feel comfortable tackling concrete projects. The videos are now available on QUIKRETE.com. QUIKRETE Polyurethane Mortar Joint Sealant is a construction grade polyurethane sealant designed for waterproofing, sealing and tuck-pointing damaged mortar joints. With excellent adhesion and a non-sag formula, it is perfect for both horizontal and vertical applications. The sealant is also textured to blend with surrounding mortar, making it an ideal solution for aesthetic mortar joint repairs unlike typical caulks, which are usually un-textured and can leave behind a shiny, gray finish. QUIKRETE Polyurethane Concrete Crack Sealant is a construction grade polyurethane sealant that permanently repairs, seals and waterproofs cracks in concrete, masonry and stucco surfaces. Its non-sag formula is ideal for both vertical and horizontal applications. The sealant dries to a durable and permanent flexible finish and is textured to blend with concrete surfaces, thereby avoiding unsightly repairs. 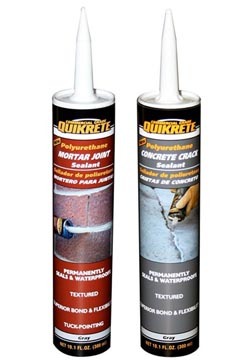 QUIKRETE Polyurethane Concrete Crack Sealant offers excellent adhesion and helps prevent damage caused by water and ice. The QUIKRETE Companies offers two e-newsletters, this version for consumers and an edition for professionals. If you are interested in subscribing to the professional version of the e-newsletter, click here. Need more know-how? Check out the QUIKRETE Guide to Concrete. Featuring step-by-step descriptions, full-color, photography, quantity calculators and helpful hints and insights for dozens of concrete, masonry and stucco projects.